Login to your Account Management, navigate to Manage Account -> Trade Configuration -> Market Data and select the relevant packages and/or subscription you wish to subscribe to based on the products you require. One way to determine which market data subscriptions are required for a given security is to enter the contract into a TWS watchlist and the right-click on the contract to select "Launch Market Data Subscription Manager". This will launch a browser window to the market data subscription page of a subscription covering the indicated instrument. Once you have selected the relevant packages, click on the "Continue" button and confirm you have made the right choices in the following screen. Important: Market Data subscriptions are billable at the full month's rate and will not be pro-rated. 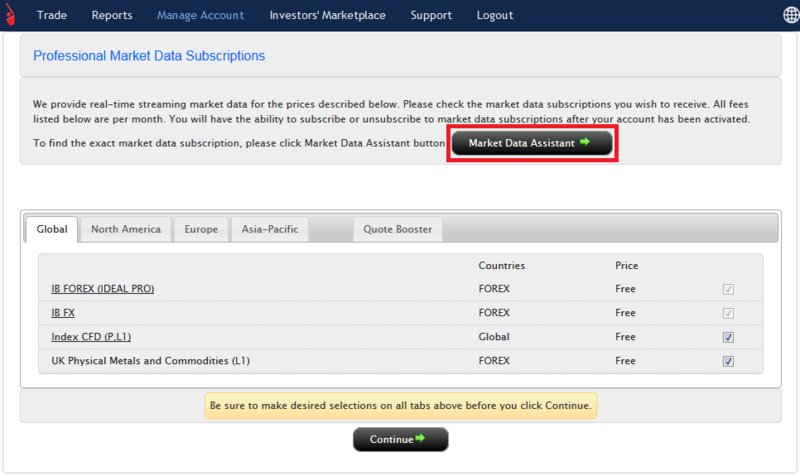 Market data subscriptions are done at a TWS user name level, not per account. This implies that live market data subscriptions need to be purchased per every live TWS user. The only exception to this rule are paper trading users. To share the market data subscriptions simply access your Account Management and navigate to Manage Account -> Settings -> Paper Trading where you will be presented to the screen below. It will take up to 24 hours until the market data sharing takes effect. 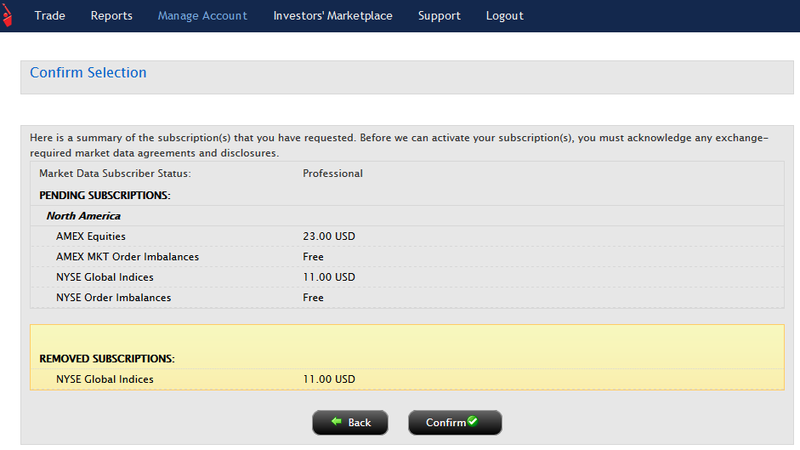 You have shared the market data subscriptions accordingly as described above. You are NOT logged in with your live user name at the same time on a different computer. Whenever a user requests an instrument's real time (top-of-book) market data either from within the TWS or through the TWS API, the user is making use of a market data line. Market data lines therefore represent the active market data requests a user has. By default, every user has a maxTicker Limit of 100 market data lines and as such can obtain the real time market data of up to 100 instruments simultaneously. This limit however can be further extended either through the purchase of quote booster packs or by increasing the equity and/or commissions of the user's account. For further details on how to increment the number of market data lines or how is your market data lines' entitlement calculated, please refer to our website's "Market Data Display" section within the Research, News and Market Data page. Note: It is important to understand the concept of market data lines since it has an impact not only on the live real time requests but also for requesting market depth and real time bars.